(Newser) – China's first moon rover has touched the lunar surface and left deep traces on its loose soil, several hours after the country successfully carried out the first soft landing on the moon in nearly four decades. The 300-pound "Jade Rabbit" rover separated from the much larger landing vehicle early today; State broadcaster China Central Television showed images taken from the lander's camera of the rover and its shadow moving down a sloping ladder and touching the surface, setting off applause in the Beijing control center. 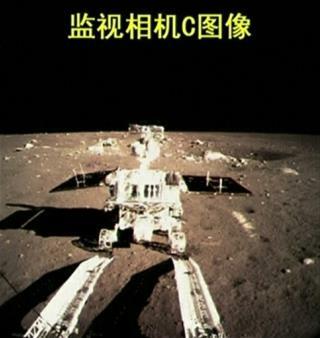 It said the lander and rover, both bearing Chinese flags, would take photos of each other this evening. "Over the next 10 to 20 years they'll certainly be rivaling Russia and America in this area and maybe overtaking them in some areas." It all depends on how much technology they are able to steal in the next few years.